Smithfield Police to join first responders across Red Sox Nation in support of the 4th annual Home Base “No-Shave November” campaign: Home Base is a Red Sox Foundation and Massachusetts General Hospital Program that helps Veterans and their families heal from invisible wounds, such as PTSD and Traumatic Brain Injury. During the month of November, Chief Richard P. St. Sauveur, Jr., in an effort to bring awareness to the wounds affecting our Veterans, as well as to raise money for Home Base, will be permitting Smithfield Police Officers to grow facial hair. 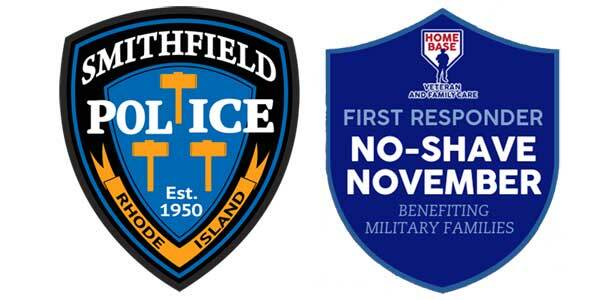 You can support the Smithfield Police in their efforts by visiting https://because.massgeneral.org/SmithfieldPD and making an on-line donation to Home Base. You may also drop off a check, made payable to Home Base, at the Smithfield Police Department.